World 7-7 is the seventh level of World 7 in New Super Mario Bros.. To reach this level, the player should take the secret exit in World 7-6. This level mostly comprises of Donut Blocks and one-way platforms. There are several Red Koopa Troopas and Koopa Paratroopas. There are few solid ground areas through the level, and there are several item blocks. Beyond the first third of the level are many moving platforms. There are no secret areas in this level, therefore all the Star Coins are relatively easy to get. 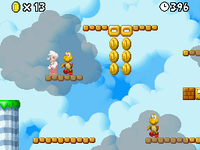 At the end of the level, a Red Koopa Paratroopa can be used to gain height on the flagpole. Star Coin 1 - Mario must ride the first paddle wheel platform he sees, where he must ride the platform all the way to its lowest point to reach the first Star Coin. 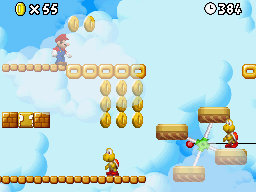 Star Coin 2 - The second Star Coin lies below the platform Mario would normally cross. He should stand on the Donut Blocks above the Star Coin and wait for them to drop. As he falls, Mario must slide down the wall and Wall Jump to collect the Star Coin. Star Coin 3 - The third Star Coin is found soon after the second Star Coin, where the screen rises upwards as Mario jumps over a series of Donut Blocks. He should then jump from the top set of Donut Blocks to get the Star Coin above him. This page was last edited on April 6, 2019, at 01:47.